Let me introduce to you to my new best friend: nomato soup. Doesn't it look great? Bright red, juicy and fresh - you can almost taste the tomatoes. 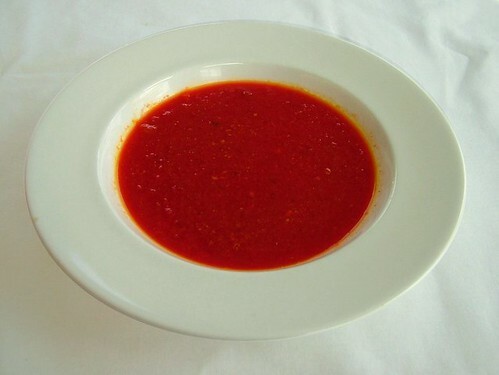 I didn't make a spelling mistake, by the way, this isn't Tomato soup, that is out of reach for me at present. This is Nomato Soup (I know, even by standards, that is an awful pun). This is my first attempt at cooking food that doesn't contain the nightshade group of ingredients. I appear to be having a bit of an allergic reaction to nightshades at present, so until the hospital says otherwise, they are off menu. That means out with the tomatoes, peppers, aubergines and potatoes along with chilli in all forms and paprika. So this juicy bowl of soup which looks and even smells like tomato & basil soup is actually the recipe below which tastes suprisingly good with a bit of pesto and cream cheese stirred into it! I cook this without using any added flavourings which means it will work as a tomato-style base for soups, stews or curries. If you wanted to, you could add herbs or spices during the cooking process but, for me, this would then limit the applications afterwards, so I prefer to keep it simple until I know what recipes I am going to use the sauce in. Peel and finely grate the carrots, beetroot and the apple. Heat a large pan (I used a Le Creuset casserole) on a low hob with 1 tbsp of rapeseed oil. Add the onions and the garlic and stir until softened - this will take about 10 mins. Add the celery and allow this to soften for around 5 minutes. Add the grated vegetables and apple and stir well until everything is blended and lightly covered in oil. Add the bay leave and enough boiled water to cover the vegetables. Bring to the boil and add the cider vinegar. Turn the heat down to a simmer, cover with a lid and leave for 30-40 minutes. After 30 mins, the vegetables should be softened and the juices should be deep red. Puree the veg, I used a stick blender in the pan, but you can use a liquidiser or food processor. At this point you have the soup. To serve it as soup, add the stock cube and allow to dissolve, then check the seasoning adding salt and pepper as required prior to serving. If you want to make the sauce, don't season yet. Turn the pan up to a gentle bubble and leave uncovered until the liquid has reduced by a third. Now add the 1/2 - 1 stock cube, check for seasoning add salt and pepper to taste. Volumes - this made me a big bowl of soup, then 2 x 500g + 1 x 300g freezer packs of sauce.